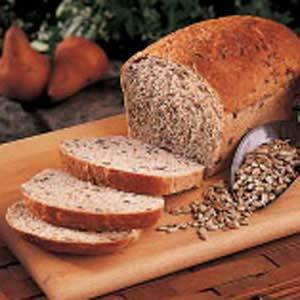 For a low-carb diet, this recipe will allow you to create bread for things such as toast, sandwiches and more! 22. Separate egg yolks from whites. Place egg whites in a container and save for later. 33. Mix the egg yolks with toasted sesame oil and melted ghee. 44. Pour water into the mixture and mix well. 55. In a separate bowl, mix flax, psyllium husk, baking soda, caraway seeds and salt. 66. Beat egg whites until the form soft peaks. Add cream of tartar while beating, which will help them stay fluffy. 77. Add the egg yolk mixture to the dry ingredients bowl and process well. Immediately after you add egg yolk mix, add a quarter of the egg whites to lighten up the mixture. 88. Add sunflower seeds and fold them into the batter. 99. Add batter to the loaf pan and bake for 60 minutes. When done, immediately remove loaf from pan using the parchment paper and let cool for 15-20 minutes.